Last week I forced Mister A to watch an old episode of Airline with me on Sky 3. When I say I made him watch, he was actually building blocks at the time so he wasn't really paying attention to it - or so I thought! 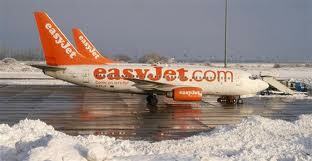 Anyway, the flights from Luton Airport were all grounded due to snow. "Look at the snow!" I shouted and beckoned him over. "Wow Mummy, it's all white, look." "And do you know where snow comes from?" "Yes mummy, I do." he smiled, looking very pleased with himself that he knew the answer. "It comes all the way from London, Luton." "London, Luton." he repeated as if I was stupid for not hearing him the first time. "I don't understand Mister A, why do you think snow comes from London, Luton?" "We saw it at the airport on the TV, remember?" I just stared back at him in disbelief. I think I need to be very careful what I watch on TV now when Mister A is in the vacinity! I've now explained where snow really comes from and that Luton was just one of the places that the snow fell on! He didn't seem convinced! Really? You call that a stocking filler? Christmas Maternity Wear from only £6.00! Mummy, How Will Santa Get In? How cute does Little E look in this dress! WIN A FESTIVE DINING SET WORTH £310! !